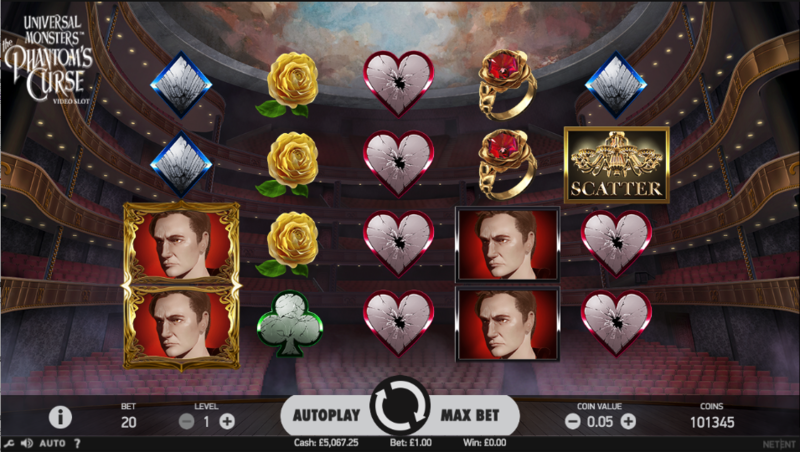 If it’s a bit of culture you’re after then why not check out this online slot based on The Phantom of the Opera. It’s called Universal Monsters: The Phantom’s Curse and it comes with various bonus features and some state of the art graphics – read on to find out more. Universal Monsters: The Phantom’s Curse is a five reel slot with four rows and forty fixed paylines; all the action takes place within the auditorium of the opera house – complete with some stunning ceiling artwork – and there’s some suitably dramatic music to keep things interesting. The higher value symbols are the unmasked phantom, Christine, a ruby ring, a yellow flower, an elegant mirror and a dagger; playing card symbols inlaid with cracked mirrors represent the lower values. The unmasked phantom and Christine can appear stacked on reels one and five respectively. Wins can be formed from right to left as well as left to right. The basic wild symbol is the mask and it will substitute for all others to help form winning combos except for the scatter and bonus symbols; however other symbols can also act as wilds in certain circumstances and this is explained a bit further down. This is triggered by landing three of the scatter symbols anywhere on reels one, three and five; you will now receive an unlimited number of free spins on a set of reels in which each reel is connected to an arm of a chandelier. If a masked phantom appears on a particular reel, it will be highlighted – when all reels are highlighted the round is over. The masked phantom is also wild during this round and it will become stacked on any highlighted reel. Trigger this by landing the unmasked stacked phantom (two positions high) on reel one and a stacked wild mask on reel five; all bonus symbols, phantoms and wilds will now remain in place for one free respin and act as wilds for that spin. 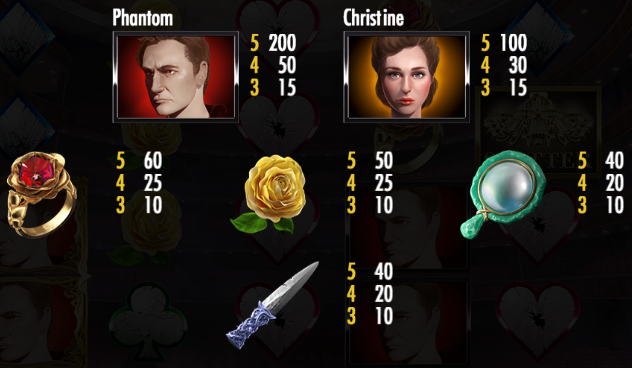 This is activated by landing the unmasked stacked phantom on reel one and the stacked Christine on reel five; this is a two stage picking game – in the first stage you select from eight roses to find coin prizes until you find the blocker at which point you move on to the second stage; here you select from three mirrors which will award a multiplier of up to 3x of the coin win. There’s a maximum win of 7200 coins in this bonus. Universal Monsters: The Phantom’s Curse is a great looking slot from Net Entertainment with lots of atmosphere and plenty of complexity in the bonus features (subjectively perhaps a little too much). It’s an engaging game for sure and it comes with an RTP of 96.57%.